On September 6th Thursday, 2018, Deputy Secretary Wang Shenggang, Division of European, Asian and African Affairs Director Li Xin, and Division of Recruitment and Training for Studying Abroad Program Officer Liu Lei from China Scholarship Council (CSC), and Second Secretary at the Embassy of the People’s Republic of China in Japan Chen Huilin visited YNU. The visitors were welcomed by President Yuichi Hasebe, Executive Director and Vice President Fumihiko Nakamura, Professor Haoyuan Xu from International Strategy Organization, Professor Hiromi Kabashima from the Faculty of International Social Sciences, International Office Manager Tomoko Takeuchi, International Office Deputy Manager Takayuki Kuribayashi, and International Admissions Office Senior Staff Kenichiro Murakami. In the meeting, President Hasebe stated welcome greetings and told that YNU is going to continue to actively accept excellent students who were dispatched from "Chinese Government Graduate Student Overseas Study Program" or "Collaborative Training Program", also, would like to strengthen cooperation between Japan and China. Following by that, Mr. Wang appreciated the acceptance of this visit and told that he thinks the relationship between CSC and YNU is important due to the YNU’s achievement which has accepted many Chinese international students so far. 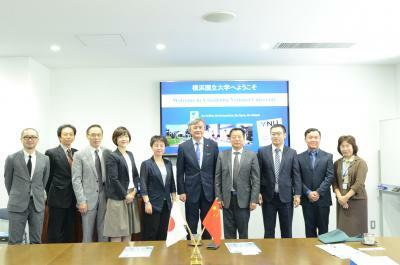 Then, CSC and YNU agreed to conclude the MOU which was the purpose of this visit as soon as possible and would like to cooperate to expand further relationship between CSC and YNU. 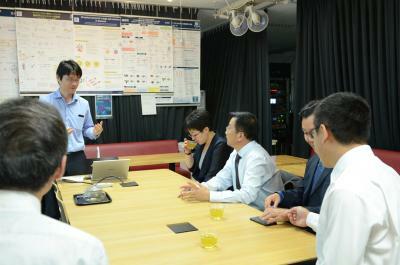 After the meeting, the delegation of CSC visited each laboratory of Professor Hideo Kosaka and Associate Professor Tomoyuki Horikiri from the Faculty of Engineering. Then, they had lunch with Executive Director and Vice President Nakamura and other YNU members, and this visit ended in a peaceful atmosphere. Through this visit, the further development of exchanges between China and YNU is expected.